With the kids now out of school, with plans for summer vacations, and with temperatures soaring — we’re supposed to have 100-degree temperatures here in the Midwest within the next day or two– we’re in the season of playtime! 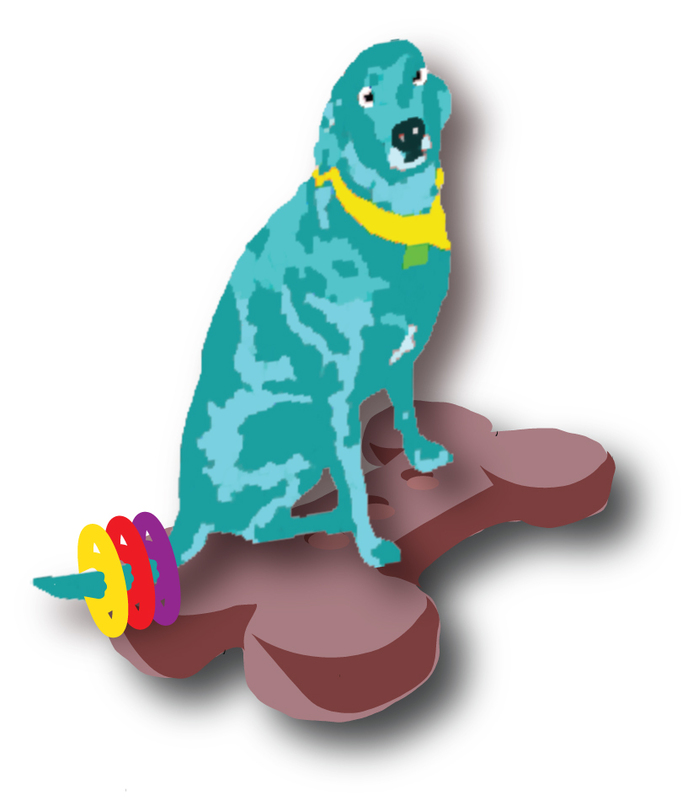 And, does Dogbotz Boneyard have the playthings for you and your family, neighbors and friends. For the scholar of foreign cultures: a German garden lotto game and Schafkopf card game as well as the classic French traveling game of Mille Bornes. Micabotz, the assistant and sweetheart of Dogbotz, went shopping for his birthday. As Dogbotz is a collector of vintage metal belt buckles – he likes attaching one or two to his dog harness when he goes for a walk – Micabotz went on the hunt and, after sniffing around numerous regional estate sales, came home with two pawfuls of buckles, of which one buckle will be buried for Dogbotz in his favorite hole near the cucumbers and tomatoes, and the remainder will be sold through Dogbotz Boneyard. 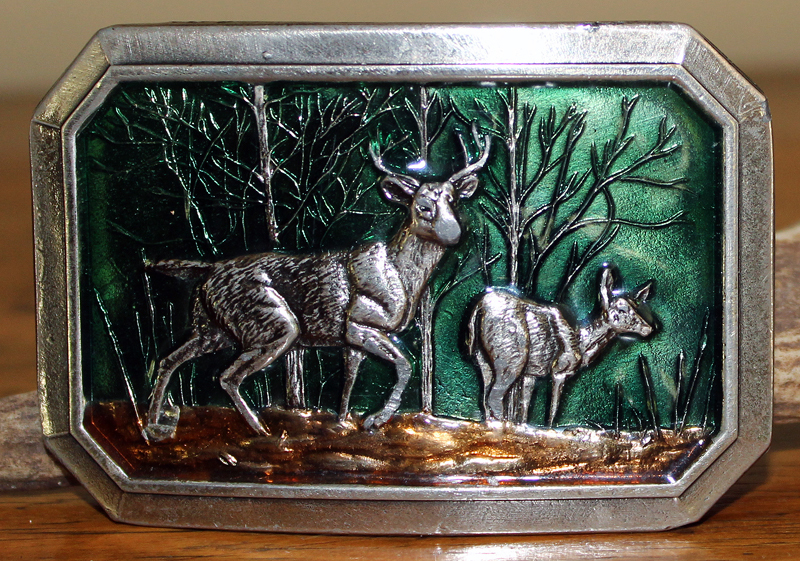 The Great American Buckle Company was located in Chicago, Illinois and produced some of the most stunning buckles for decades until it closed several years back. 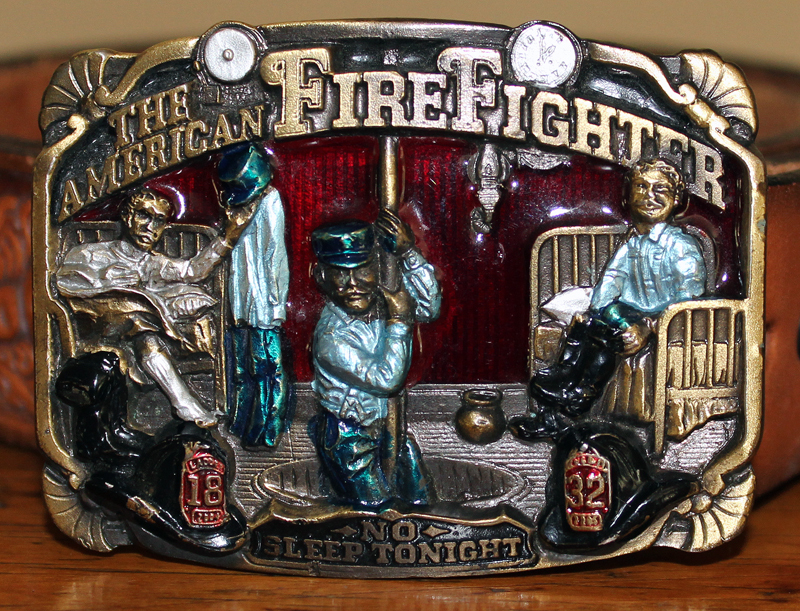 It manufactured all sorts of cowboy, motorcycle club and union worker belt buckles, all of which are now very collectible. Here’s some of the wonderful belt buckles that Micabotz found on her recent journey, soon to be available through the Wearables department of Dogbotz Boneyard. However, since The Great American Buckle Company is located in Texas and no longer in Chicago, and since she wants to hide more buckles for Dogbotz’s future birthdays, Micabotz is curious as to who is the leading manufacturer of belt buckles these days in the Midwest. Can you help her? Throughout the years, friends have made such comments as “Wow, Patrick, you’ve collected some really wonderful artwork!” or “Where do you find all these fabulous paintings?” or “You really have an eye for art.” Oddly, I’m not personally convinced that I consciously know the fabulous or the wonderful when I come upon it, and being myopic, I remain uncertain that I have the proverbial eye for art. Nonetheless, family, friends, neighbors, and folks with whom I correspond are curious about my personal taste in art and how that impacts what artwork the Dogbotz Boneyard Gallery of Art offers for sale and which artists it promotes. So, when people ask me how do I “know” which piece of art to buy or which artist to collect (and I do collect artists, often buying several of their pieces at a time), I simply tell them this: “I honor my gut.” What I mean by this is that I listen to and trust my intuition as I look at a painting, drawing, sculpture, or whatever form, and consider the story or the sentiment being shared. For me, it’s usually 50% epiphany (“OMG, this is the piece I’ve been waiting to see!”) and 50% intimate bonding with the artist (“I never expected to be touched in this way.”). If neither the awakening nor the connection is there, then I do not buy the artwork. This is not a judgment for or against any one piece of art or any one artist, as another viewer and potential art collector may experience the epiphany and the bonding in a piece where I haven’t — that’s the wondrousness of human diversity. I’m just conveying that these two elements are the essential criteria that impel me to collect a specific piece of artwork or a set of images created by a specific artist. Also, I don’t strive to buy what’s pretty or worse yet what’s trendy or the worst of all scenarios I need something to fill this space in my living room. What I do know is that I collect what I like: the unexpected, the subtle, the vibrant, the serene, the traditional, the outlandish, the real and the spiritual. My collector’s palette enjoys the many flavors of art, being just as diverse as the colors on an artist’s palette. I have acquired art that encompasses the gamut of medium, style and theme. From my perspective, it’s not a choice of Impressionism versus Modernism, the Abstract versus the Real, or Outsider Art versus Traditional Art (as if there ever were such a thing). Nor do I care whether the artist is well established in the art field or is an emerging artist. Nor do I collect art primarily based on its potential investment value, as who’s in and who’s out shifts with the winds of time, though I do genuinely hope that by collecting a certain artist’s work, her/his artwork increases in value so she/he can continue to create art unimpeded by financial concerns. No, in my view, it’s about the marvel of feeling a connection with someone’s vision or interpretation of life that haunts me, in a profoundly healing way, to the very marrow of my bones. That’s what I like, that’s what I collect . . . and that’s what influences the selection of art and artists promoted through the Dogbotz Boneyard Gallery of Art. So, wanting to share with you some of the treasures I’ve collected over the years, here are examples of artwork currently up for sale as well as some samples of what’s yet to come. 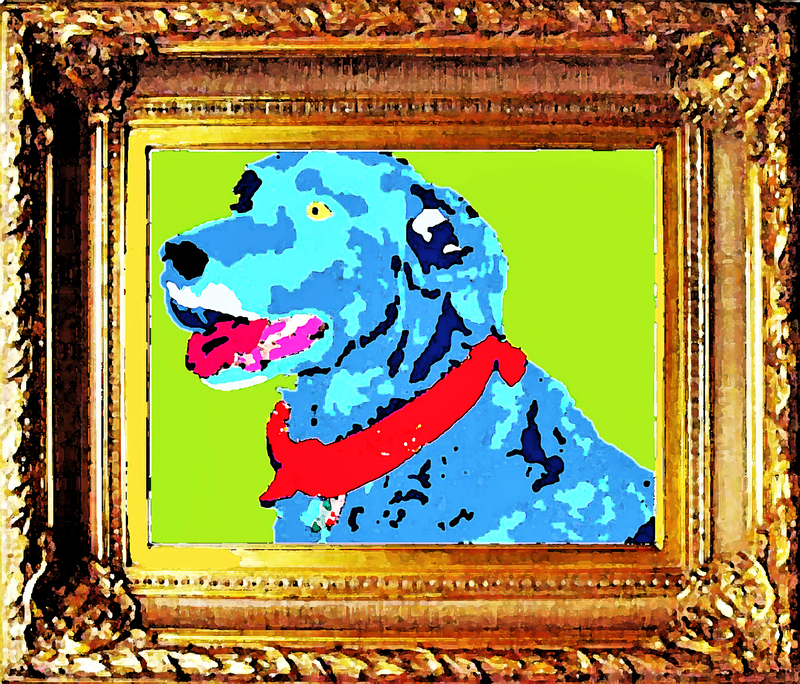 Today, surrounded by an extensive gallery of fine art and gemstone figurines, sporting a vintage hippie dog collar, and with a penchant for collecting belt buckles manufactured by The Great American Belt Buckle Co. of Chicago and primitive ducks decoys, canine co-founder Dogbotz has been on a fascinating journey. 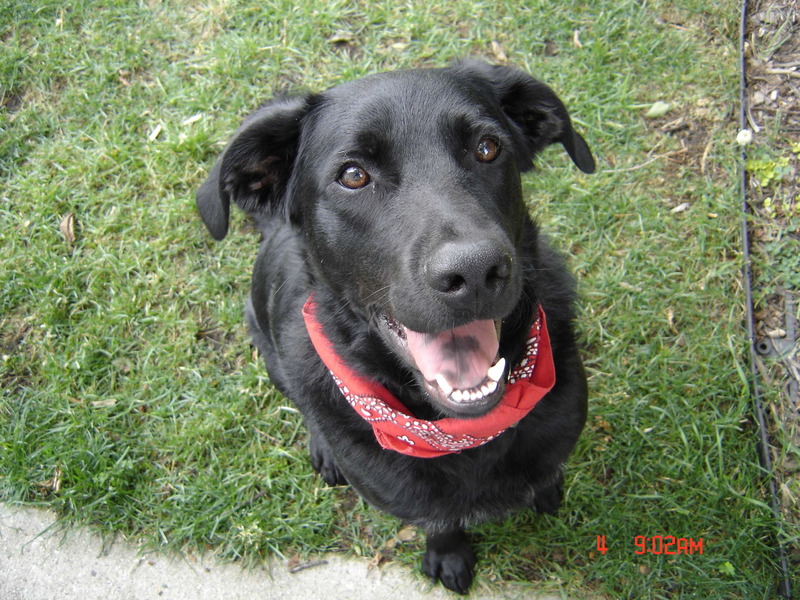 Dogbotz has always been a “wild child,” particularly as a pup, running around the fields and farmyards in southwestern Illinois, where he had been born and then abandoned, probably the overly mischievous one his mother couldn’t control, so she unceremoniously kicked him out of the pack and onto a journey of free-for-all feral living. He lived by his own wits, frolicking hither and yon and wherever desire or an unknown scent took him, basking in the sunlight and dreaming in the moonlight, hunting squirrels and chipmunks and rabbits as well as the occasional inattentive duck, and eluding men and their farming vehicles. It was all so very exciting, so very “living by the fur of one’s tail” . . . and also quite short-lived. One day a few months after his departure from home, in the midst of a summer drought, a local farmer caught Dogbotz red-handed — well, actually red-pawed — in the chicken coop with his fangs clutching the neck of a very fat hen. Hunger and what seemed like an easy opportunity for its abatement had done him in. After several noisy minutes of clucking, growling, swearing, and a rifle being fired, he was apprehended, immediately deemed guilty, and then transported to a facility in the windy city of Chicago, where his demise by lethal injection, sadly and euphemistically known as “being put to sleep,” seemed the only logical conclusion. Yet, such was not to be, for the three canine Fates of Doggerel, Dogma, and Doghouse had woven a lengthy rawhide braid for him to enjoy throughout his lifetime, and only a few mere inches had, at that moment, been chewed. Thus, the photos she had taken of Dogbotz appeared not on the State of Illinois’ Most Wanted Canine Criminal List but on the Happy Tails Looking for a Home online service, where his profile was reviewed several time by a loving couple who adored his playfully mischievous mug and knew he would make the right companion for them. From there — well, you can read all about it in the About Us section of Dogbotz Boneyard. Let’s just say Dogbotz went from “rags to riches,” sniffing out the collectible and vintage items he now enjoys burying in the “boneyard” of his home. So squirrels, rabbits and chipmunks: watch out and stay on your own turf! Costume Jewelry Is Very Retro! Ladies, with the arrival of summer, so too come all the fun activities of the season: beach parties, family picnics, June weddings, ethnic festivals and summer soirees. And what could be more delightful than wearing a delicious piece (or two or three) of costume jewelry? Many of our friends, neighbors, and colleagues have told us that the costume jewelry of their grandparents’ and/or parents’ times has come back into fashion. Costume jewelry is “oh so very retro!” claims our dear friend Bonnie. Well, Dogbotz Boneyard is pleased to say that we have an excellent collection of costume jewelry from the decades of the 1920s to the 1970s, plus some contemporary peices that reflect the rhinestone, Bakelite, and cameo craze of those decades. Coro, Jonette, Juliana, Trifani, Weiss, Sarah Coventry, Whiting Davis, Kenneth J. Lane, and the Mazer Brothers – we have collected some of the best names in vintage costume jewelry. 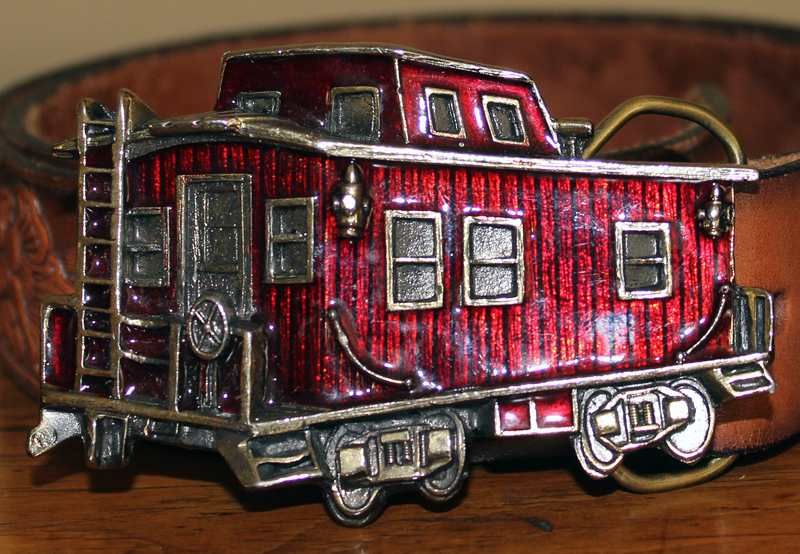 So, visit us at www.dogbotz.com to see all the wonderful costume jewelry we have . . . and return regularly as we make available for sale in the “boneyard” additional costume jewelry. And, if you’re a collector of costume jewelry, let us know what you’re interested in seeing as we may have some pieces in our inventory that we haven’t released for sale yet that you might enjoy, so feel free to connect with us at info@dogbotz.com. Enjoy the summer, and let your own beauty shine! Dogbotz Boneyard welcomes you to our initial blog . . . and to our Grand Opening! We have just opened our online resale shop at www.dogbotz.com, where we offer a great variety of collectible, primitive, vintage, antique, hand-crafted, natural, repurposed and fair trade products as well as vintage and contemporary art. Our store departments include Artwork, Furniture, Home Goods, Metalwork, Playthings, Wearables, and Etc. We currently have about 130 items for sale; however, our inventory continues to grow so we’ll be updating our product pages in the weeks ahead. So, come and join the fun at www.dogbotz.com! Look around our store called “the boneyard,” and see what you’d like to add to your own personal collections. Also, if you sign up for our newsletter at our website, you’ll be notified about some of our great sales.